The Number ONE video converter in your language! 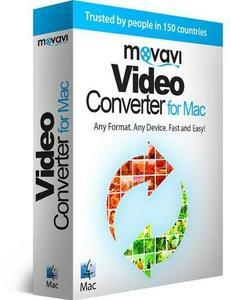 Video Converter Movavi is a powerful yet easy-to-use video and audio file converter that’s specifically designed for the Mac. It’s the perfect tool for fast multimedia conversion between popular formats and has no negative impact on the quality. The innovative SuperSpeed conversion mode lets you change video formats with no loss of quality as quickly as just copying files between folders. Smart format and device conversion presets speed up the process even more. Plus, you can batch-convert your media, and choose different parts of your videos to convert if you don’t need the entire file encoded. With Video Converter Movavi, you can select any part of the video to convert. The conversion will be completed even faster, and the video or audio fragment will be saved as a separate file. Convert video, including DVD, HD and AVCHD, and audio between most popular formats, including AVI, MPEG-1,2, MP4, 3GP, Flash (FLV), MOV, MKV, WMV, MP3, WAV, OGG, AAC, FLAC, and more. Video Converter Movavi also enables you to convert video and audio for many popular mobile devices with just one click. The program supports iPod, iPad, iPhone, Sony PlayStation, HTC, BlackBerry, LG, Samsung, Nokia, Huawei, Xiaomi, and more. Just plug the device into your computer, click a button, and the converter will automatically recommend the appropriate settings for saving. Support for H.265 codec when converting to MP4 and MKV formats.